Come join us and bake your own Matzah and enjoy this amazing event for the entire family. In this fun and educational experience which will be taking place in Sudbury for the 14th time this year, participants dressed in baker's hats, will experience the 18 minute journey of the Matzah from threshing and winnowing the wheat stalks to watching their fresh Matzah pop right out of an authentic Matzah oven. Each child will take home an individually boxed, full-sized, delicious Shmurah Matzah that is Kosher for Passover. The Model Matzah Bakery is guaranteed to bring an exciting educational experience to the Jewish community of Sudbury and the surrounding towns. The Model Matzah Bakery features wheat stalks, brick ovens, millstones, etc. which are all setup to form an old style Matzah Bakery. 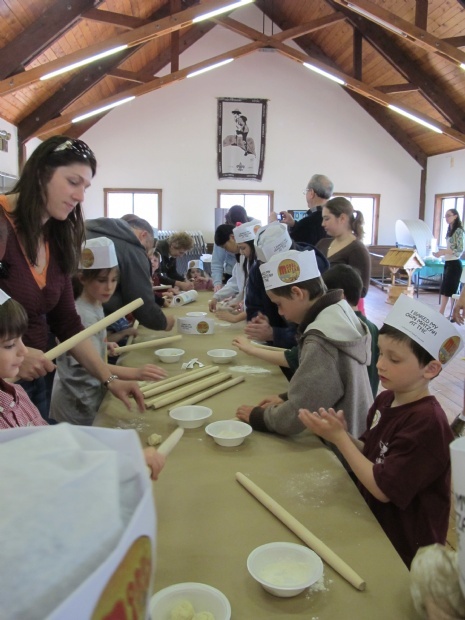 In the Model Matzah Bakery, children learn how the traditional Shmurah Matzah is made - literally from start to finish and gain a deeper understanding of the Passover story and its traditions. For extra fun, some arts and crafts and the chance to meet Moses and Pharaoh add to the fun. The full program takes just over an hour. Since the Matzah that the children produce themselves will not be kosher for Passover each child will take home an individually boxed, full-sized, delicious Shmurah Matzah that is Kosher for Passover. The boxes will also include the Four Questions as well as a Pesach Guide.